For 2014, the rally and UK Coach Awards have gone their separate ways following the co-ordinated event in 2013. This appears to have had minimal impact on attendance at the rally itself which, at 41, attracted slightly more entries, likely driven by the Diamond Jubilee significance and an increase in multiple entries. 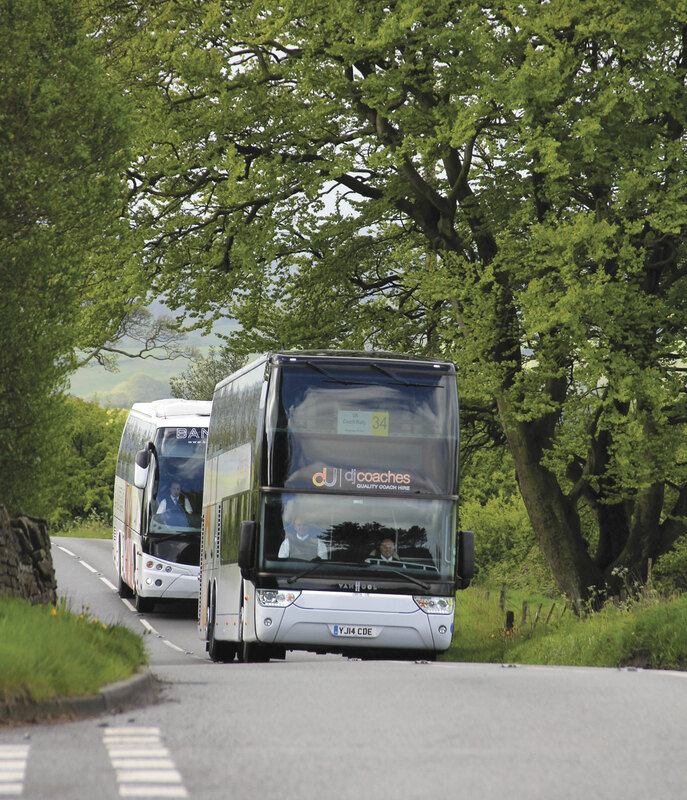 With dual sourcing in place, Parrys International Travel entered examples of both models which had previously been named ‘Coach of the Year’, perhaps the ultimate showdown! Go Goodwins, Coopers Tours, Stanley Travel and Bibbys of Ingleton all entered more than one vehicle whilst there were two minicoaches. Another nine vehicles were entered in the heritage display. The entries in the rally itself ranged from high specification vehicles delivered in the past week back to Go Goodwins Duple Commander bodied AEC Reliance from the late 1960s although the emphasis was on the former with a strong presence of Van Hool, Neoplan and Irizar (both integral and Scania based) products. 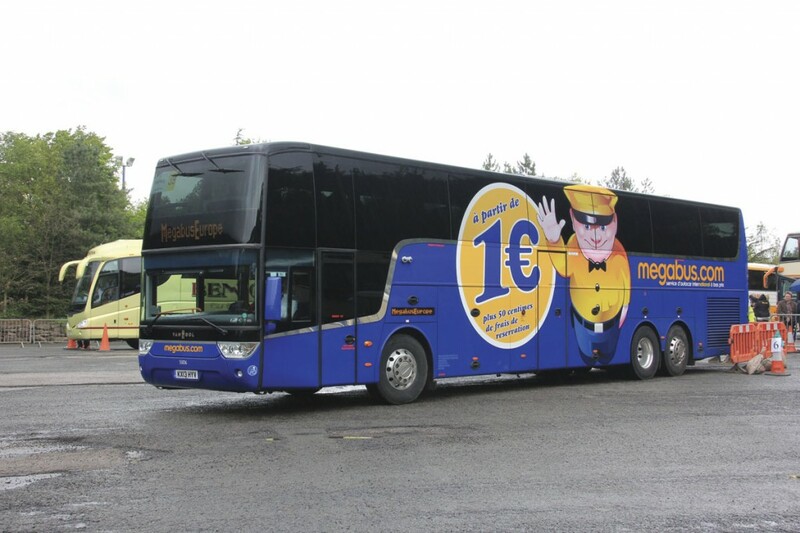 For the first time in recent years, there was a left hand drive coach taking part, this being one of the intensively used Van Hool Altanos operated by Stagecoach (Midlands) on Megabus duties into Europe. Saturday started with a road run through the Staffordshire Moorlands where the early starters even had to cope with sunshine before the heavy showers, as well as the narrow and winding roads that characterise the local area. Arriving back at Alton Towers, drivers took part in the Saturday tests before most took advantage of the site’s bus wash area to clean off the morning’s road grime ready for the concours judging on Sunday morning. Many made frantic efforts to blade off the rain water before the judges’ arrival but the continued showers sent the judges regularly running for shelter and accepting that all vehicles would be judged wet. Particularly heavily hit by the showers were the final driving tests at lunchtime on Sunday and the dedication of the marshals who stuck to their exposed posts must be commended. On the Saturday evening, there was a well attended diamond themed dinner dance at the Alton Towers hotel. The stage was set with two large diamonds hung either side complementing a snowy backdrop where the cabaret kicked off with an excellent rendition of Diamonds are Forever. The theme continued with diamonds sprinkled on the tables and the food was traditionally nostalgic; soup, roast beef and Yorkshire pudding, followed by baked Alaska. The diamond theme was also reflected in the programme design that also included a look back at many of the programme covers from the past 60 years. 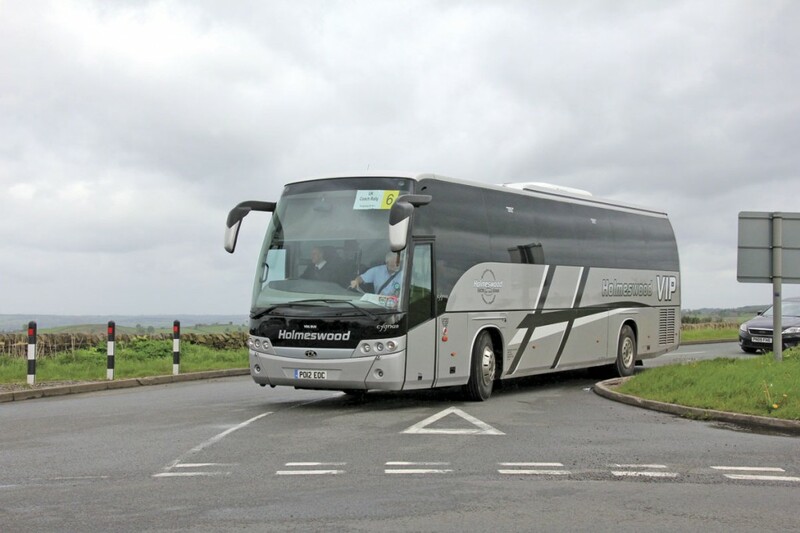 For the fourth consecutive year, Parrys International Tours gained the event’s premier award, the UK Coach Rally Coach of the Year. The company’s Neoplan Starliner 2 to Euro6 standard was one of three delivered for the 2014 season and featured in Bus and Coach Buyer 1269 (28 March 2014). Supplied by MAN Truck and Bus in Manchester, the 14m coach featured 48 well spaced reclining seats and a number of detail changes following Parrys’ experience with their 2013 winner. It also received the Peter Rogers Trophy for the highest placed vehicle from a CPT member. The UK Coach Rally Coach Driver of the Year accolade, sponsored by Wrightsure Insurance Group, was awarded to Steven Davies, driving a Plaxton Leopard bodied Volvo B9R for first time entrant, Prospect Coaches (West) of Stourbridge, West Midlands. Steven has only been a professional coach driver for 14 months but brought with him 40 years driving experience including a 27 year Police career. This included a period of time as an advanced Instructor with the Police Driving School and as a Traffic Patrol Officer. 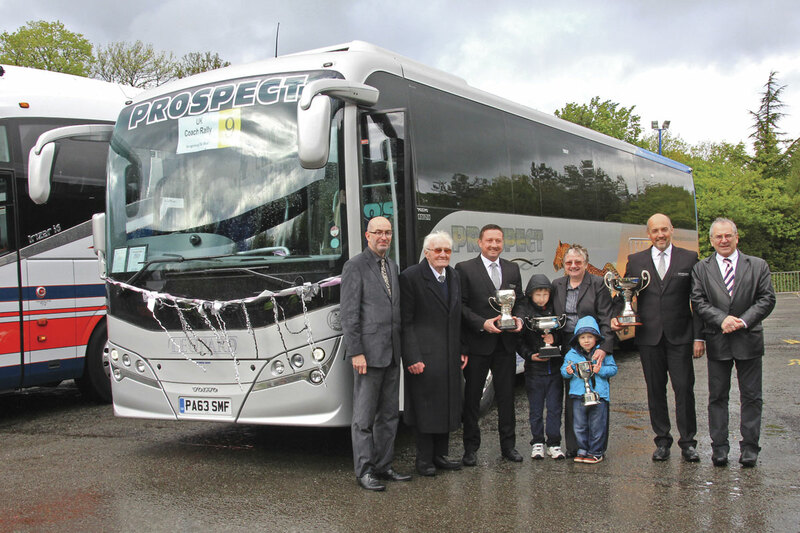 The Leopard also took home the Top Standard Coach trophy, the Plaxton Trophy for the top Plaxton and the Kirkby Trophy for the top coach supplied by Plaxton Coach Sales, leaving with a silverware tally matching the four generations from the family business present at the Rally. 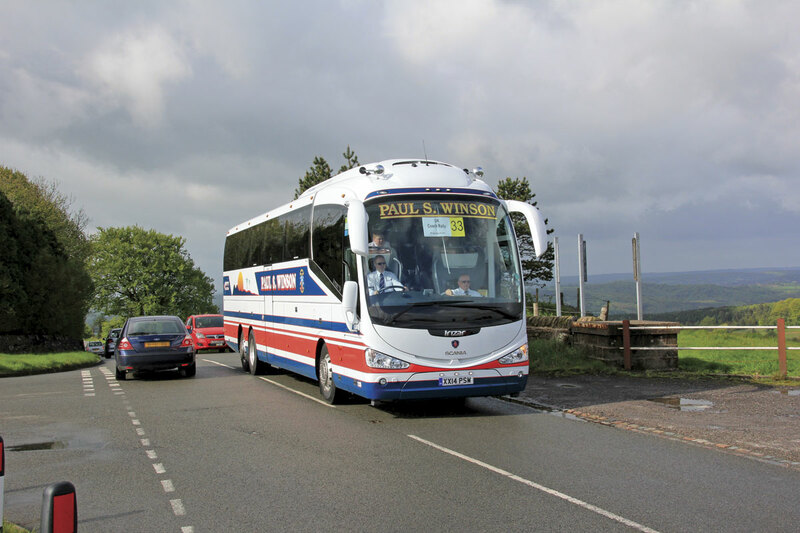 The Alan Goodwin Trophy for the Highest Placed Coach Operator in all categories went to Paul S Winson (Coaches) whose entry was a newly delivered 14m three axle Scania K400EB with Irizar i6 coachwork. This also took the Scania Trophy for the highest placed Scania and driver Matthew Winson, gained the Peter Bostock Trophy for the highest placed driver in the Saturday tests. The two entries in the minicoach category each gained an award with Ian Haines of Haines Minicoaches being named UK Coach Rally Mini Driver of the Year in his 2014 Ferqui Soroco Mercedes-Benz Sprinter. 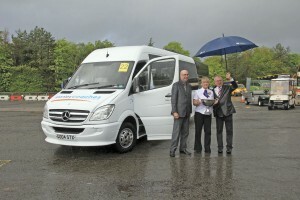 Top Mini/Midi Coach was awarded to the 2008 Onyx converted Mercedes-Benz Sprinter entered by Stanley Travel and driven by the youngest driver in the Rally, Gabi Scott, daughter of Director Ian Scott. Gabi’s enthusiasm for the event and the industry bodes well for the future of the family business. With Van Hool products accounting for around a third of the Rally entrants, they provided keen competition and accounted for all three concours awards for which they were eligible. 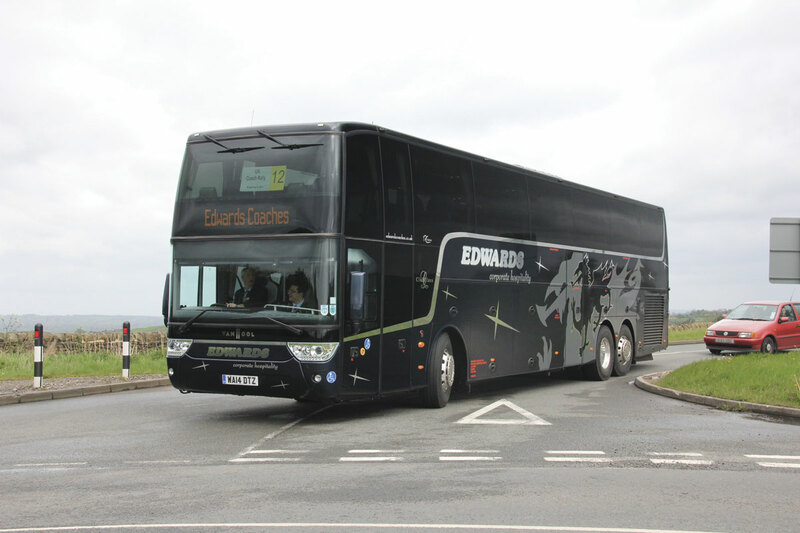 Top Touring/Express Luxury Coach together with Van Hool and Moseley Trophies plus the Cymru trophy for the best coach from Wales was gained by Edwards Coaches of Pontypridd with a newly delivered 14.6m TDX21 Altano in a distinctive black livery. Top Executive Coach was awarded to Go Goodwin’s TX17 Astronef with three distinct internal zones for their English Cricket Board contract. Go Goodwins also took first and third place in the Carol Goodwin Memorial Trophy for heritage vehicles with their Bedford VAS and Dennis Lancet respectively. Kenzies Coaches took home the trophy for the Top Coach Five Years or Older with their 2008 Volvo B12B based Alizee T9. 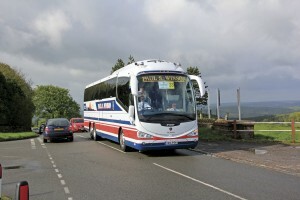 Top Team of the Year was awarded to Holmeswood Coaches crewing the 2012 VDL SB4000 with Beulas Cygnus coachwork that also gained the Beulas Trophy. 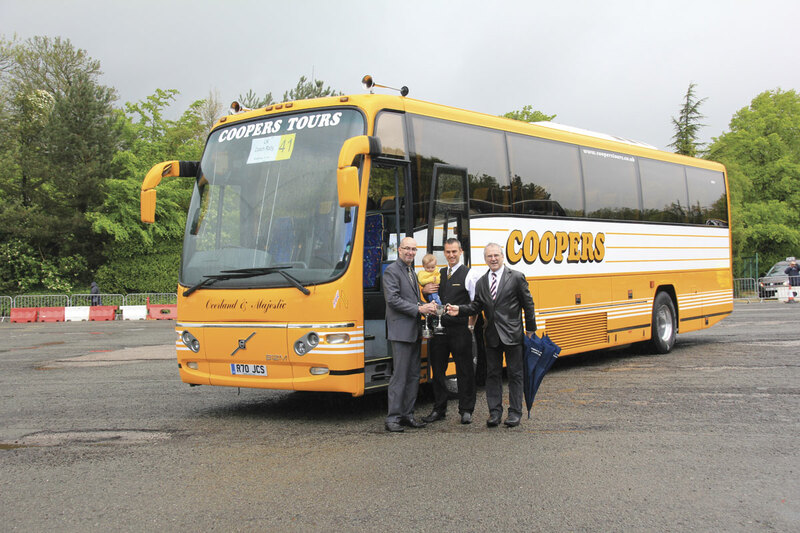 Runner Up Driver of the Year was Russell Cooper of Sheffield based Coopers Tours driving a 2001 Volvo B12M based Plaxton Panther. This also gained the Volvo Trophy for the Top Volvo Coach supplied by Volvo Buses and the company’s AEC Reliance was runner up in the heritage class. 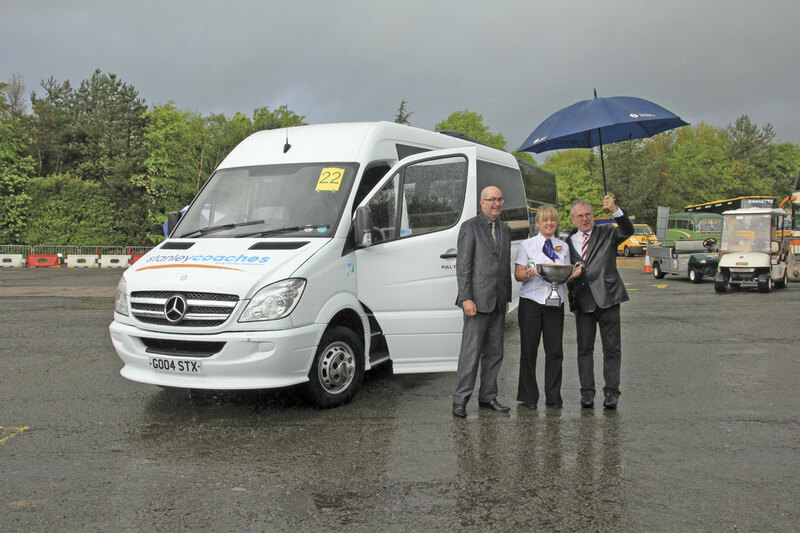 The John Fielder Memorial Trophy for the top coach from a small fleet was presented to the Mercedes-Benz Tourismo of Middlesex based Everydays Travel. 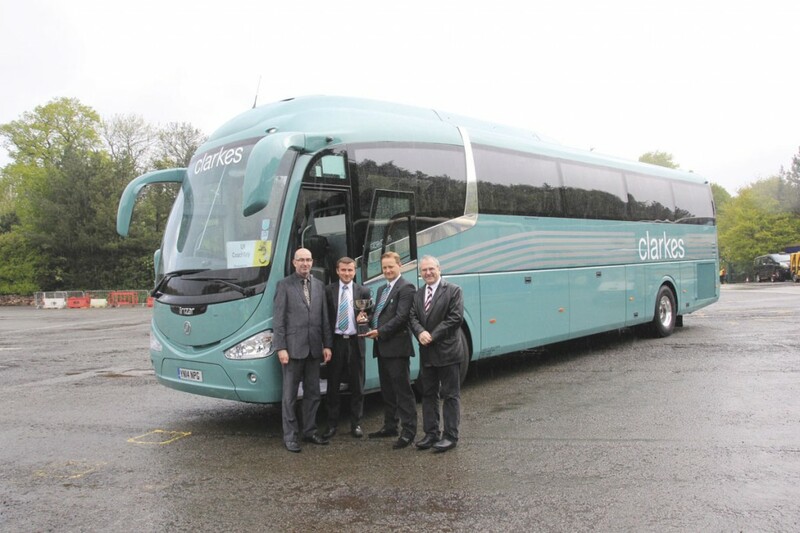 The 2013 vehicle is the first full sized coach for the minicoach operator. 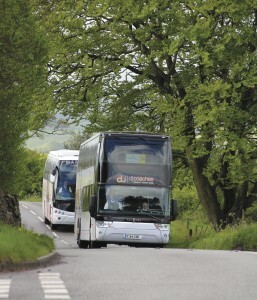 Further manufacturers trophies were awarded to Falcon Coaches (VDL Berkhof for their Berkhof Axial bodied Volvo B12B), D J Thomas Coaches (Kassbohrer Trophy for the highest placed Setra with a 2007 S415GT-HD), Leons Coach Travel (Neoplan Trophy for their 2014 Starliner 2), Dews Coaches (Mercedes-Benz award with a 2013 Tourismo) and Clarkes of London (Irizar Trophy for their 2014 DAF engined Irizar i6). Special awards went to Prentice Westwood (Tony Roose Trophy for the best coach from Scotland), Bensons Travel (Fred Bibby Memorial Award for the best loved coach), DJ Coaches (LTCOA Martin Cornell Trophy for the highest placed LTCOA member in all categories) and Michael Plucknett of Blakes Coaches (The Maurice Wrightson Memorial Shield sponsored by drivers from Stanley Travel for the oldest employed driver in the rally). David Eyre of Robin Hood Coaches won the Directors Challenge Trophy.